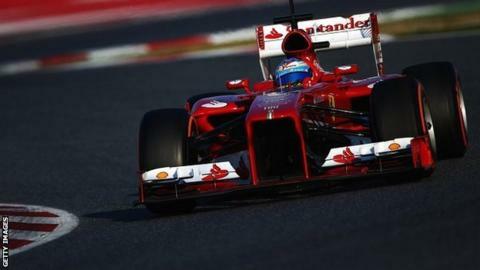 Ferrari's Fernando Alonso set the pace in Barcelona on the penultimate day of the second pre-season testing event. At the Circuit de Catalunya, the Spanish double world champion posted one minute 21.875 seconds - 0.285 secs quicker than Sauber's Nico Hulkenberg. Lotus's Romain Grosjean was third, 0.313 secs behind Alonso with Mercedes driver Nico Rosberg fourth. McLaren's Jenson Button was seventh, 0.965 secs off the pace with Red Bull's Mark Webber ninth. Rosberg took over from team-mate Lewis Hamilton, who will be back in the car on Friday for the final day of this testing event, while Button was having the first of two consecutive days in the car after team-mate Sergio Perez ran on Tuesday and Wednesday. Williams' Pastor Maldonado was fifth fastest, ahead of Button and Adrian Sutil, who is in the Force India as the team evaluate contenders for the second seat alongside Scot Paul Di Resta. Sutil, who was found guilty of grievous bodily harm in February last year following an incident in a Chinese nightclub, had not driven an F1 car since the end of 2011. The other candidate for Force India is Frenchman Jules Bianchi, the team's reserve driver, who will be in the car on Friday, the final day of the test. Alonso, Hulkenberg and Grosjean set their best times on the 'soft' tyre, which is considered to be about 0.8 secs a lap faster than the 'medium' used by Rosberg. Button was less than a second behind Alonso despite using the 'hard' tyre, which is at least that much slower than the 'soft'. But even times set on the same type of tyre are not necessarily comparable as the fuel loads drivers were using are not made public and these can make a huge difference to lap times. Webber and Button are in their cars for the first time at this track, which is regarded as one of the most complete tests of the capabilities of a grand prix car. Alonso was having his final of three consecutive days before handing over to team-mate Felipe Massa on Friday. Alonso said: "We concentrated on a comparison of the (tyre) compounds, starting with the soft and moving on to the hard in the afternoon. "We tried various aerodynamic configurations and for the first time, we made some set-up changes to get a good understanding of tyre behaviour and degradation. "With every change we made, the car reacted as I expected and it was useful to try out the different settings, especially to understand which direction we need to go in next week, when there will be a greater emphasis on performance. "Once again this year, the tyres will be one of the crucial aspects to manage: they are softer and quicker, but also less consistent and they degrade rapidly with every lap. "We will have a lot of work to do to understand how best to balance the car, but that applies to all the teams." Lotus and Red Bull both completed race simulation runs in the afternoon session. Alonso ran for a long time on hard tyres, interspersed with pit stops in which he would sit for five seconds before getting on his way again.